It is difficult for an established artist to surprise their own fanbase at a live show. Seattle’s Say Hi hasn’t toured for about three years and their fans have been eager to see them with a new record and on the road again and their wish icame true with Eric Elbogen (essentially the only member of Say Hi) touring in anticipation of an upcoming record named Endless Wonder. Elbogen apparently spent his time off from touring not only sculpting the new record but coming up with a new stage show that would make long time fan’s jaws hit the floor. The run of tour dates paired him with Australian duo and fellow label mates on Barsuk Records, Big Scary. Behind their new record Not Art, Tom Iansek on lead vocals, guitar and keyboard and drummer and backup vocalist Joanna Syme took a stab at the US with their mostly laid back pop rock approach. They have a heavy dose of drums along with a strong keyboard presence on most songs like on one of their high points “Luck Now.” The audience they would play to at The Slowdown in Omaha would be mostly female and skew younger than most crowds. Big Scary would work their way through mostly songs of their new record like “Phil Collins” and “Hello My Name Is” to a respectful reception from the crowd who would stay seated away from the stage but be very into the entire set. Elbogen would join them on stage for the bulk of the set on bass. 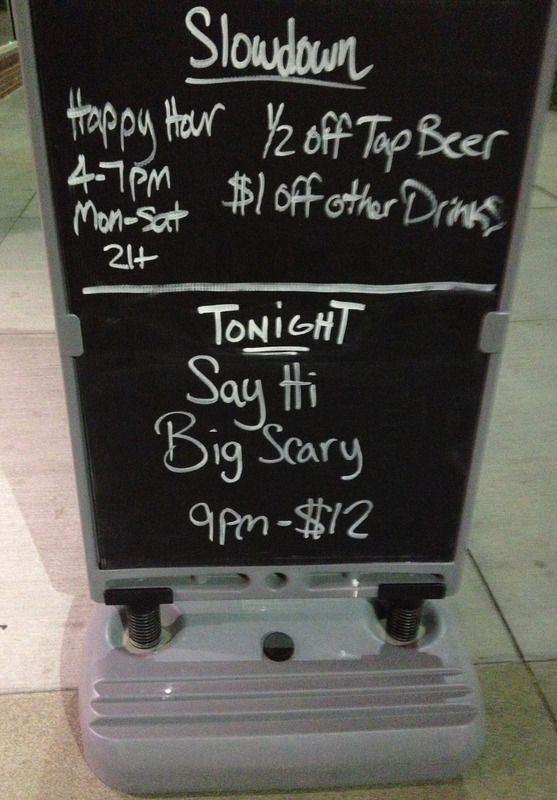 Australians Big Scary play Omaha, Nebraska on their tour with Say Hi. Say Hi would then take the stage to the delight of the many fans who have followed their previous seven records released since their start as Say Hi To Your Mom back in 2002. The brilliant Say Hi record Um, Uh Oh found Elbogen touring as a drummer/guitarist/vocalist with the help of two other members, a bass player and guitar/keyboard player a few years ago. While that record did dial back the synths and have more of a rock feel than their other material, nothing could have prepared me for the start of the Say Hi set. 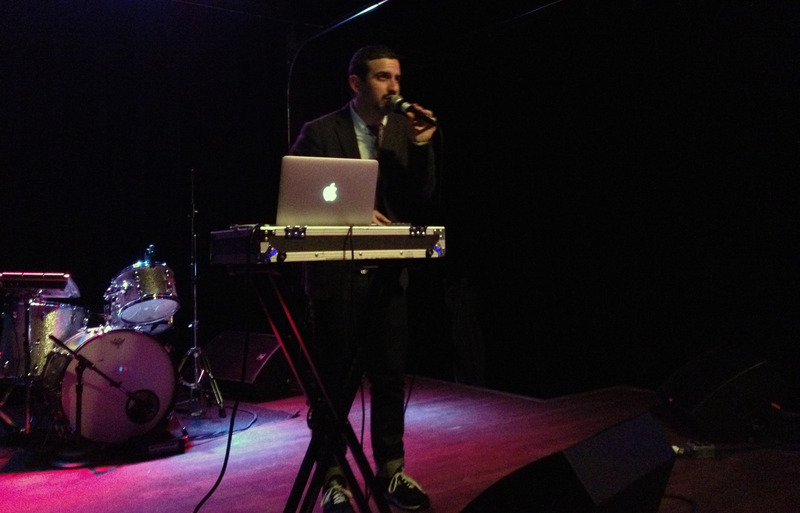 Elbogen bravely set up his laptop with a small touchscreen keyboard and grabbed a mic and was ready to go. No drums. No bass. No guitar… just pre-tracked songs ringing out of his Mac with him singing along. The songs from the whole Say Hi catalog were present but the blast of electronic distortion would take the place of any percussion of stringed instruments. Instead Elbogen held the mic tightly with one hand and played synth solos making the tips of his fingers glow orange instead. With a little stylish awkward white guy dancing with a mic he would deliver his songs and potentially rupture the hearts of long time Say Hi fans. The songs were undoubtedly recognizable but still undeniably different. Great Say Hi classics like “One, Two… One” and “Devils” would play from the stage while the audience would try to process what was happening. The response was decent; people sang along, people clapped and not one member of the respectable sized audience would vocally disapprove. Say Hi’s Eric Elbogen plays the part of a one man band in Omaha, Nebraska at The Slowdown Front on 4/18/14. The techno sheen put on lively songs like “Blah Blah Blah” and “Oh Oh Oh Oh Oh Oh Oh Oh” were interesting and puzzling at the same time. Elbogen would urge the crowd to sing along with one of their better known songs (with one of the great song titles of all time) “November Was White, December Was Grey” while the delicateness and desperation of the song couldn’t help but be stripped by the presentation. Some songs fit the sound well like “Take Ya Dancin'” and “Blah Blah Blah” while others like “November Was White…” and “Maurine” were left a bit too far from the original versions. New songs “Such A Drag” and “Like Apples, Like Pears” went over well but their impact seemed a bit lost in the broad spectrum because everything sounded a bit new. The encore of “Let’s Talk About Spaceships” and “Super” seemed fitting but like with all shows from a band with eight albums, left gaping holes in the setlist that many wish could have been played. Songs like “Bluetime” and “Bruises To Prove It” simply wouldn’t fit and were sincerely missed. Paying a band to tour is expensive, they deserve a strong cut of the money and if an artist can represent his songs fairly by himself, fiduciarily it makes much more sense to not drag others along. Maybe Elbogen thought this presentation was the way most of these songs were meant to be heard. Maybe the last tour with a band was the weird one as it was just to fit the record he was supporting. No matter what the reasoning, this incarnation of the band Say Hi wasn’t as good for me, that might be a minority opinion but I would take Elbogen armed with an acoustic guitar over wielding a Mac any day. That being said the man has absolute balls of steel for doing this. As he would sway and dance while singing he would glance up to gauge reactions to what was happening, it felt like a bit of an experiment at times with each audience being a microcosm of guinea pigs. The stage show was enjoyable and pulled off well, very well actually. If this show was the expectation of what was to happen, it likely would have been great. I just can’t help but want to hear guitars and drums. 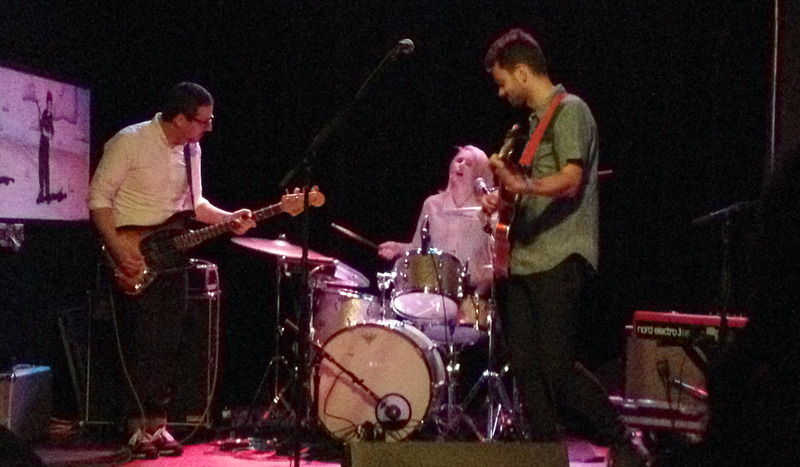 This entry was posted in Concert Review and tagged Barsuk, Big Scary, concert review, Endless Wonder, Eric Elbogen, Joanna Syme, live, NE, Nebraska, Not Art, Omaha, Say Hi, Say Hi To Your Mom, setlist, show review, Such A Drag, Tom Iansek, Um Uh Oh. Bookmark the permalink.